An unique library accessing 70,000+ E&P technical documents and journal articles, offers a multi-society search across a broad range of oil & gas exploration and production literature. Organizations with documents covered by OnePetro include: Offshore Technology Conference (OTC) and Society of Petroleum Engineers (SPE) for which MUN community has online access to the full-text of all papers; World Petroleum Council for which MUN Libraries have DVD hosting all WPC papers; and others. Index and Abstracts - Over 6,650 major journals across 150 scientific disciplines, social sciences, arts, and humanities - Includes full indexing from Science Citation Expanded (1900-present), Social Sciences Citation Index (1956-present) and Arts & Humanities Citation Index (1975-present). 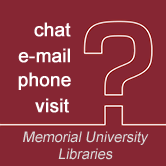 Many of the e-books available from Memorial University Libraries are listed individually in OneSearch. At the top of the results screen, select "Full Text Online". On the left side of the screen, scroll down to the "Refine My Results" section. Under "Resource Type," select Books. If Books does not appear under "Resource Type," select "More Options" to view a full list and tick the box in the Include column next to Books.